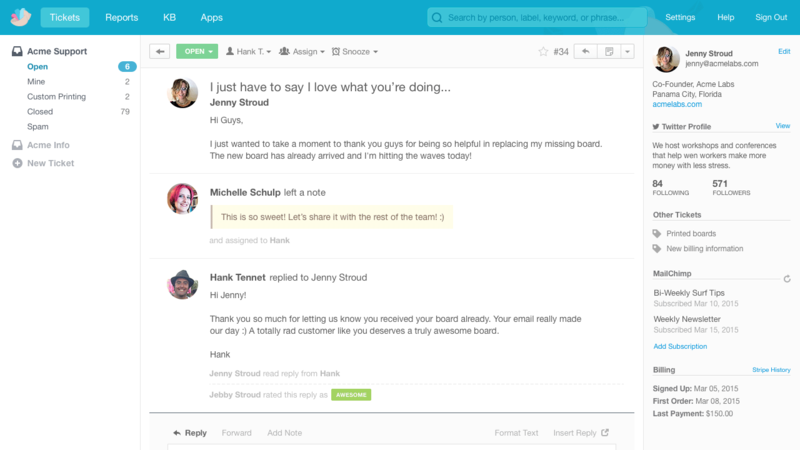 Groove is help desk software designed for small customer support teams that looks, feels, and works a lot like Gmail. In fact, if you could take your Gmail account, enable it to be shared with others, allow private messaging that customers would not see, and track everything via a backend reporting system, you would have Groove. According to Len Markidan, Groove’s marketing director, who spoke with Small Business Trends via telephone, Groove is simpler to use than other help desk platforms, provides more personalized assistance and is designed for businesses that have outgrown Gmail or Outlook for customer support. Markidan said that Groove is ideally suited to 20 to 50 person companies that have a support staff of three to ten people. Groove divides its platform into four main components: ticket management, knowledge base, support widget and reporting database. Ticket Assignments. Agents share the workload by assigning tickets to other agents or groups. Private Notes. Agents can collaborate behind the scenes with private notes that only the team sees. Ticket Statuses. The platform categorizes tickets into one of three statuses: Open, Pending or Closed. Multiple Mailboxes. Agents can support multiple email addresses from the same dashboard with an unlimited number of mailboxes. Other features include the ability to merge tickets, attach files, prioritize tickets, log phone calls, see Facebook posts and tweets, set rules to automate workflows and create labels to organize tickets or tag them for future reference. The Knowledge Base ensures customer service is online, 24/7, even when agents are not available. Companies can personalize the Knowledge Base with their logo, custom branding and HTML/CSS. Customers can search articles to find answers in 12 different languages. Agents can save articles in draft mode, add photos and other media and create articles using a WYSIWYG Editor. A third component of the system is a support widget (shown in the image above) that collapses when not needed but that pops-up when it is. The widget suggests answers as customers search and sends messages into the dashboard so agents can reply quickly. Like the Knowledge Base, the widget is also customizable, to fit the company’s branding. A fourth component is a reporting database that includes metrics like customer feedback and satisfaction ratings, trends, average first reply times and ticket handle times. Groove’s focus on simplicity of use and personalized support are what separates it from other help desk software, according to Markidan. There’s nothing more personal on the web than one-on-one email. However, as businesses grow, it gets harder to keep things that way, which is where help desk software comes in, Markidan said. But that’s also when a lot of businesses start to alienate their customers. 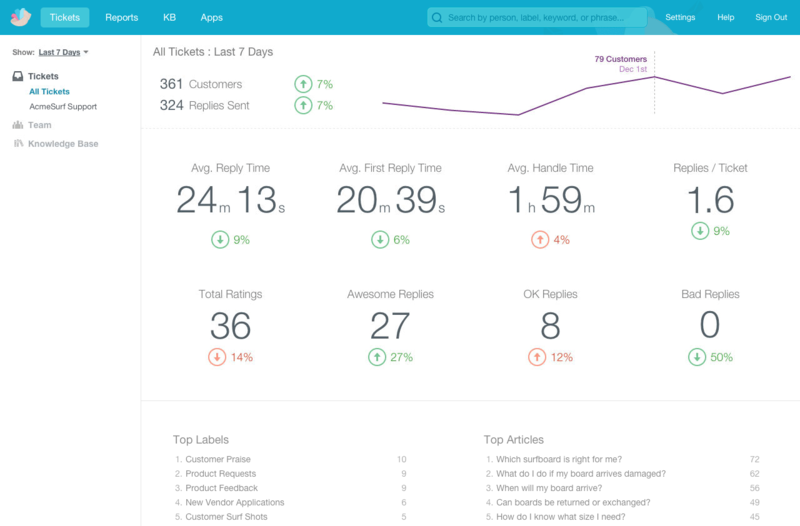 Small Business Trends relies on Groove to manage customer support. 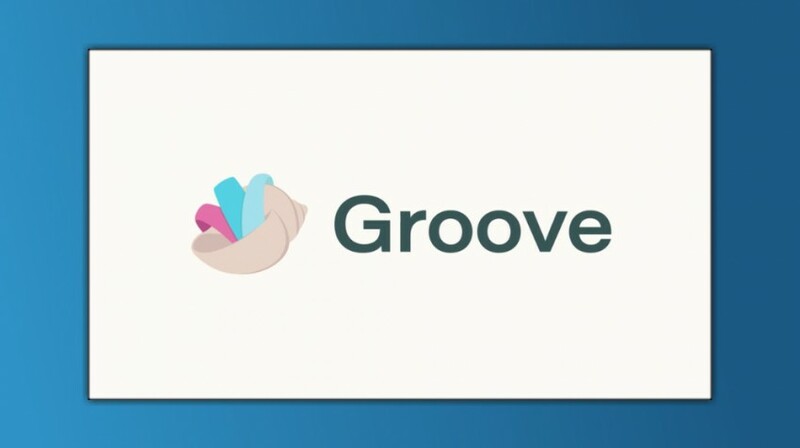 “Groove has been extremely useful to Small Business Trends as a helpdesk by enabling us to manage multiple inboxes in one central location,” said Staci Wood, chief operations officer, citing its advantages. “This is not only helpful to the company, but also to readers of the site. As with other aspects of the platform, pricing is simple and starts at $15 per agent per month. There are also dozens of free third-party add-ons and integrations, including Slack, Olark, MailChimp and Highrise.